Sergeant Michael Darrell Brown. BCSO photo. WASHINGTON, D.C. -- Retired Brevard County Sheriff's Sergeant Michael Darrell Brown will receive a Public Safety Officer Medal of Valor presented by Vice President Joseph R. Biden, Jr. and Attorney General Eric Holder during a national ceremony this morning for Brown's heroic actions in saving the life of a woman during an attempted murder by her estranged boyfriend, 42-year-old Heriberto Jimenez. A partially submerged car in Indian River following a police chase on September 6, 2011. Brevard Times / file photo. On September 6, 2011, the Sheriff’s Office received an emergency 911 call in the area of Patrick Air Force Base. The caller advised 911 operators that he had just witnessed a female exit a vehicle and start running while shouting for help. A man exited the same car, grabbed the female and forcibly placed her back in the car. The man then drove southbound on A1A with the passenger door still open. The caller believed he had just witnessed a kidnapping. Sergeant Mike Brown was in the area and observed a vehicle matching the general description traveling west on State Road 404 (Pineda Causeway) in Brevard County, Florida. He then turned on his blue lights and siren in an attempt to stop the vehicle. Unfortunately, the man driving the vehicle refused to stop. Sgt. Brown then observed a physical altercation between the driver and passenger and that the vehicle was weaving in and out of the traffic lane. The erratic movements of the vehicle were a result of the female passenger attempting to grab and pull at the steering wheel. The driver was refusing to stop and the vehicle continued westbound at a high rate of speed. The vehicle then made an abrupt turn to the right and drove right into the Indian River and came to rest in the water, more than 100 feet from shore. Fearing the man might be injuring the woman, Sgt. Brown immediately jumped into the water, maneuvering towards the vehicle. As he approached he could see the driver repeatedly striking the passenger. As he reached the vehicle he now observed that the man was repeatedly stabbing the woman with a large knife. 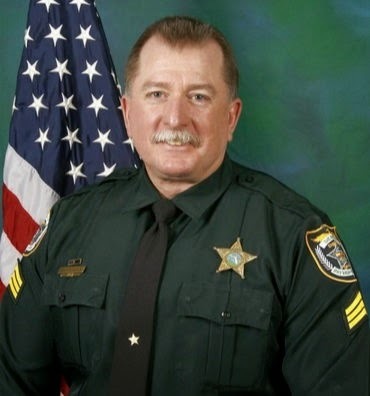 As an extremely experienced deputy who is no stranger to dangerous situations, he moved into a position so that if he discharged his firearm, the bullet would not pass through the assailant and strike the woman adding to her injuries. Sgt. Brown fired through the window, striking the driver. Sergeant Brown radioed for fire rescue units, then rushed into the river toward the partially submerged vehicle, where the man was stabbing the woman repeatedly. Sergeant Brown managed to get close enough to fire six shots at the suspect without hitting the victim. According to the U.S. Department of Justice, Brown then broke the passenger window, pulled the victim from the vehicle, and carried her to shore where paramedics began administering aid. After medical treatment, surgery, and a long hospital stay, the victim finally recovered from her injuries. Jimenez died as a result of his wounds. A total of 22 recipients from across the country will receive the the Public Safety Officer Medal of Valor, the highest national award for valor by a public safety officer.